From 23rd of September to 27th November 2016 is the show "Emotions of the Athletic Body", a photographic exhibition curated by Giorgio Armani, on display in the Armani Silos, Milan. The entrance to the museum on the ground floor. Triennale di Milano, XXI Internal Design Exhibition "Design after Design"
I have added the museum "Triennial die Milano". La Triennale di Milano is a design and art museum in the Parco Sempione in Milan, in Lombardy in northern Italy. Currently the XXI Triennale International Exhibition, Milan 2016 is presented. Map with the different locations of the XXI Triennale International Exhibitions, in and outside of Milan in 2016. Exhibition "ROOMS", 2 APR - 12 SEP 2016. Entrance on the 2nd floor to the exhibition "W. WOMEN IN ITALIAN DESIGN", 2 APR 2016 - 19 FEB 2017. Exhibition "W. WOMEN IN ITALIAN DESIGN", 2 APR 2016 - 19 FEB 2017. Photographs in front of the Museum Store. HangarBicocca is a place for contemporary art exhibitions, located in the Bicocca district of Milan, Italy. The buildings used to be a Pirelli factory reconverted into 10,900 square metres of exhibition galleries. Currently it shows the exhibition "Architecture As Art" and "Doubt" from Carsten Höller, as part of the XXI Triennale Exhibition Milan 2016. "Entrance". Maria Giuseppina Grasso Cannizzo has provided a system of entrance and passage between the Shed space and the space outside the Pirelli HangarBicocca. In front is the project "Pavilon". The installation is hanging on the side of the project "Sharing". "Roof". The roof proposed by nArchitecs for the external exhibition space is a demonstration of the concept of "almost building" on which the New York practice works: incomplete and dynamic structures that are open to the landscape and to appropriation or completion on the part of users. Carsten Höller - "Doubt" Exhibition. 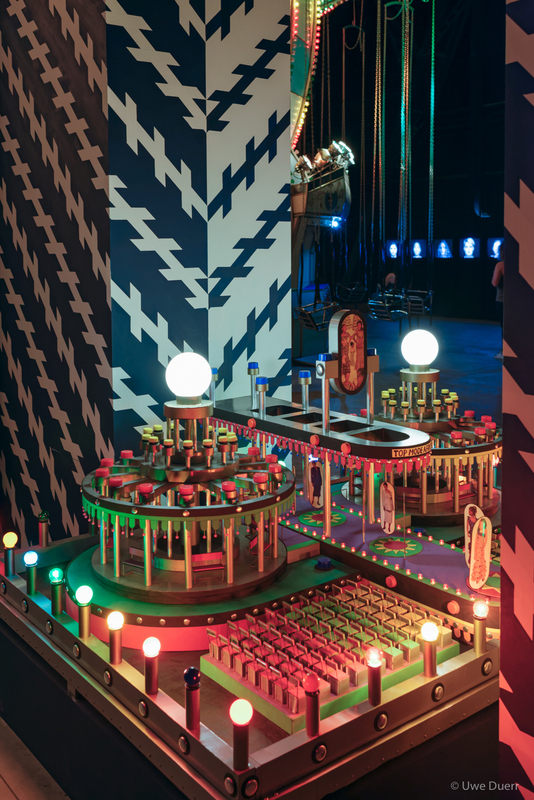 In the front: "Y" (2003); incandescent light bulbs, digital controllers, aluminium, illuminated signs at both exits, wood, steel, mirrors. At the back: "Division Walls" (2016); neon tubes, Alucobond, aluminium, transformers. 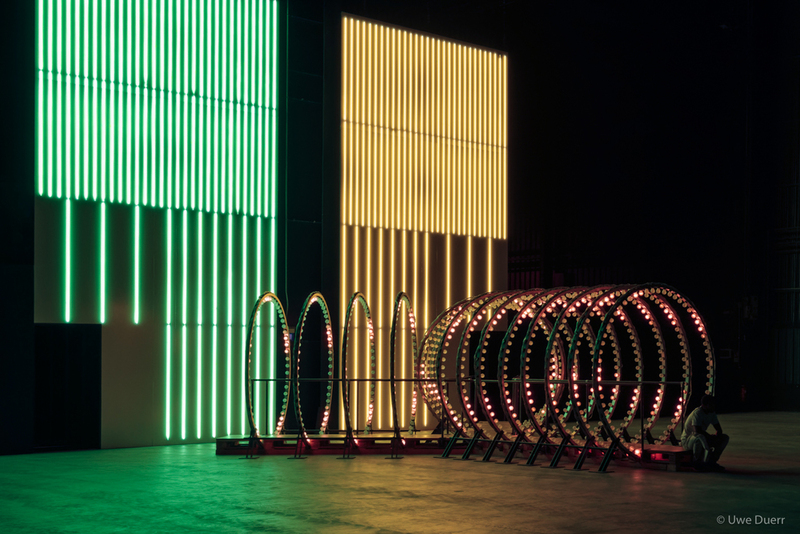 Carsten Höller - "Doubt" Exhibition. Top Mode Africa (2013), aluminium, metal foil, cork, wood, household paint, foam sheets, paper, light bulbs, capsules. Efêmero is the first intervention in a new program, “Outside the Cube”, dedicated to Street Art and other forms of art connected to the urban and public contexts. During the inaugural edition of “Outside the Cube,” OSEGEMEOS – literally “the twins,” the pseudonym of brothers Gustavo and Otávio Pandolfo (born 1974, São Paulo, Brazil) – present their first major mural in Italy. During a weekend trip I visited the Enzo Ferrari Museum in Modena, Italy. Entrance all to the Enzo Ferrari Museum. Enzo Ferrari´s office in the Maranello factory. On the last weekend I went to the Porsche Museum in Stuttgart. As usual they have updated some of the exhibitions. A technology cross-section of Porsche 968. The new display to simulate the sounds of different parts of the cars. View from the museum to the Porsche Dealer Shop and the new sculpture „Inspiration 911“ from the english artist Gerry Judah, unveiled on 31.08.2015.